An important feature in the identiﬁcation and assessment of potential failure mode is the fact that both covers and liners for modern landﬁlls are typically multilayer composites composed of both soil and geo-synthetic materials. The liner system contains several interfaces whose resistance against interface shear stresses may be low, and thus these act as possible failure surfaces. Additionally, all classical geotechnical failure modes are possible depending on site-specific conditions (usually involving saturated ﬁne-grained soils) and the placement and geometry of the waste mass. Potential failure modes are summarized schematically and briefly described here below. The leachate collection system can slide on the underlying liner system if the slope is too steep or too long. This type of veneer failure often occurs during heavy rains. It is remedied by pushing the sand or gravel back onto the lined slope. However, if the failure surface is within the liner system, the reconstruction will require more effort and cost. Leachate collection soil sliding above or within the liner system is not an uncommon situation. The ﬁnal cover system (topsoil and protection soil) can slide on the liner system if the slope is too long or too steep. This type of veneer failure often occurs during heavy rain. If only soil is displaced, the remedy is to replace the soil. However, the question of long-term stability remains. If the failure surface is within the liner system, the implications are more severe. Cover soil failures of this type above the waste mass are not uncommon. The soil mass behind the waste mass or beneath the site could be unstable and fail. Failure is usually rotational, emerging along the slope, at the toe, or within the foundation. This is a true geotechnical problem and applies to steep side slopes and/or soft foundation soils. It is site specific and does not involve liner systems or waste properties. 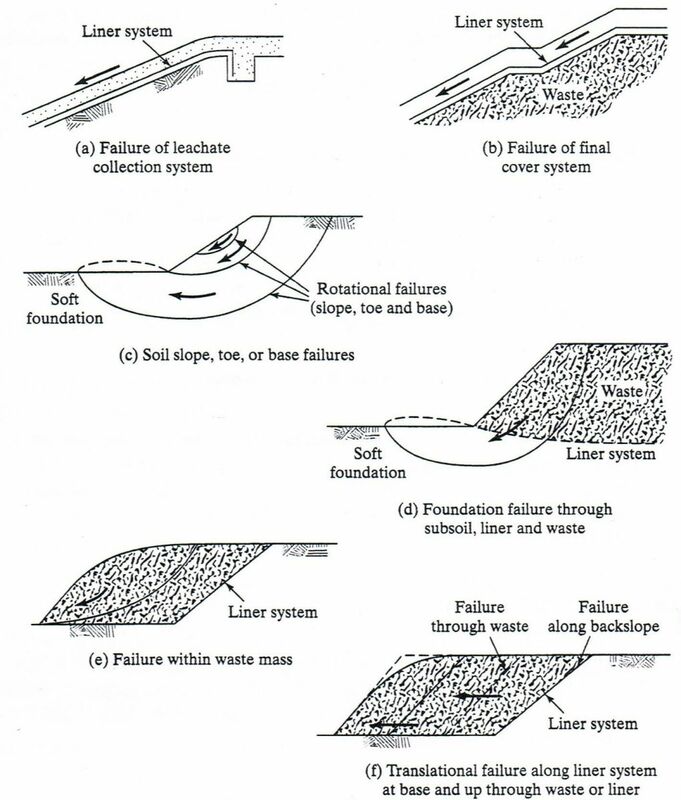 A rotational failure can be initiated in a soft foundation soil that can propagate up through the waste mass. Such failures have occurred in both unlined and lined sites, and can be massive (ex: up to 500.000 m³). Failure can occur within the waste mass, completely independent of the liner system. It is handled exactly as the geotechnical failures illustrated before, except that the material is waste (municipal or hazardous or inert) instead of soil. Such failures are prompted by steep waste slopes, high liquid content, and lack of waste placement (operations) control. A translational failure can occur with the waste sliding above, within, or beneath the liner system at the base of the waste mass. The extension of the failure plane back from the toe can propagate up through the waste, or continue in the liner system along the back slope. Such failures have occurred at both clay-lined sites and at geo-synthetically-lined sites. They have resulted in the largest failures (involving over 1.000.000 m³ of waste).